Stay up to date with the latest information from Great Scott Gadgets by subscribing to the GSG-announce mailing list. If you'd like to submit your project idea for consideration to receive free hardware from Great Scott Gadgets, please visit the Free Stuff page and send us a message! In September I made the following public comment on the Office of United States Trade Representative's (USTR) Proposed Modification of Action Pursuant to Section 301: China's Acts, Policies, and Practices Related to Technology Transfer, Intellectual Property, and Innovation. Thank you for requesting comments on the proposed supplemental action in response to China's Acts, Policies, and Practices Related to Technology Transfer, Intellectual Property, and Innovation (USTR-2018-0026). As the founder and owner of Great Scott Gadgets, a Colorado small business that puts open source tools into the hands of innovative people, I urge you to refrain entirely from imposing any new duty increases. Additionally I urge you to eliminate all recent increases made as a part of this action. Due to the inclusion of multiple tariff subheadings in the proposal, I anticipate that Great Scott Gadgets will suffer a significant increase in the cost of products we sell. Ultimately the technological innovators who are the end users of our products will bear this increase. Instead of punishing China, the increased duties will harm American innovators who rely on tools such as ours. Innovators in China and elsewhere around the world will gain an advantage over Americans as a result of the action. Great Scott Gadgets designs and manufactures open source hardware (OSHW). The OSHW community includes a rapidly growing group of companies committed to the ideals that end users have a right to fully control their own equipment and that anyone should be able to study, make, use, modify, and sell devices based on our published designs. OSHW makers recognize that, just as open source software has resulted in great advances in the software industry, open source hardware will enable future generations of hardware innovation. The growth of Great Scott Gadgets and other open source hardware and software companies demonstrates that protection of intellectual property is unnecessary for commercial success in technological markets. This undermines the USTR's argument that "China's acts, policies, and practices that effectuate technology transfer burden and restrict U.S. commerce." I maintain that open source technology greatly enhances innovation and that the best way to foster rapid development of new technology is to encourage both the free exchange of ideas and free trade of tools, materials, and all goods. In my opinion, the proposed supplemental action will have little effect on China's acts, policies, or practices but will disproportionately harm Great Scott Gadgets, our employees, our American resellers, and the American innovators who depend on our tools. Dan Groeneveld is an instructor at Northland Pioneer College in Show Low, Arizona. He is going to be teaching net security and pentesting courses this autumn, so we sent him some Throwing Star LAN Tap Kits. He is looking forward to teaching his students LAN Tap principles and soldering basics. We can't wait to see pictures of them in their lab. April's Free Stuff recipient is EFF (The Electronic Frontier Foundation). EFF is a nonprofit organization that defends civil liberties in the digital world. From their website: Founded in 1990, EFF champions user privacy, free expression, and innovation through impact litigation, policy analysis, grassroots activism, and technology development. We work to ensure that rights and freedoms are enhanced and protected as our use of technology grows. Andrés Arrieta, Technology Projects Manager, has asked for a HackRF One because: At EFF we are looking how technologies impact our rights in our daily lives. Research has already shown many vulnerabilities in the standards in implementation of mobile communications and we want to continue research in this space. Understanding how 2G-4G have really been implemented not only by Telcos but also in Baseband and how users' privacy is impacted by this. Beyond that we'd like to explore the possibilities of offering more secure communications to users and the different ways this could happen. The Free Stuff recipient for March is Jan van Katwijk, a hobby programmer from the Netherlands. He plans to use his new HackRF One to finish his work on DAB software by providing a library for HackRF, then for experimenting with wideband receiving issues. His current developments include software support for ACARS and ADS-B decoding. A full overview of his work is available here and here. Rushabh Vyas, who is a graduate student at the Purdue School of Engineering and Technology, IUPUI, is receiving four LAN Tap Throwing Star kits for use in his digital escape room projects and in his cybersecurity group, TheDen. His current forensics class is using a bomb-defusal scenario. He reports: "End goal for the forensics students is to be able to get access to Arduino code (by completing various forensics tasks such as steganalysis, data decoding, and artifact analysis), analyze the code, and be able to cut the correct colored wire for defusal in ~60 minutes." We sent a HackRF One to the University of Toronto Aerospace Team, Space Systems Division. 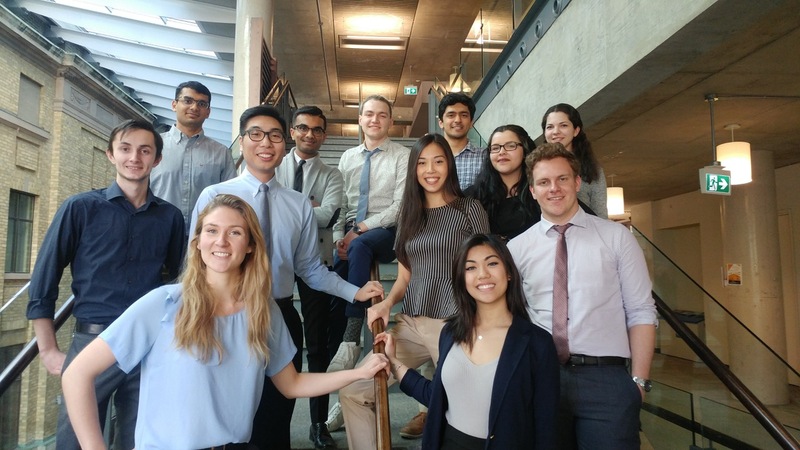 They are a team of 40 undergraduates who are working on an open source CubeSat for carrying out microbiology experiments in space! Their first satellite, HeronMk II, is slated to launch in early 2020. "We plan to use the HackRF to build a programmatic interface to our radio communications system, in conjunction with GNURadio. This will make it significantly easier for us to test our on-board computer systems, downlink payload data, and integrate and test additional satellite subsystems"
HERON Mk II is a 3U Cubesat designed and built by the Space Systems division of the University of Toronto Aerospace Team to perform sophisticated microbiology experiments in orbit. The organism of interest is C. Albicans, a yeast that is commonly found in the human gut flora that may undergo changes in its virulence and drug resistance when experiencing microgravity. One went to Brian Granby, a PhD student at Liverpool John Moores University. He is doing security research, conducting a study into emerging sensors technologies; with a particular focus surrounding network security of RF connected devices. His main focus is on the potential threats of residential and commercial gas supplier technologies found in smart meters. The other we are sending to Sudip Kar of Bangalore. He is going to use his HackRF One to introduce SDR to small village schools by helping them to set up their own weather stations that can track NOAA satellites. He is going to send us pictures after the students finish their year-end exams and start using the HackRF later this spring. Make Riga Hackerspace — HackRF one to help this hackerspace's members accomplish interesting projects, like "aiming to reach 100km with a large model rocket + balloon (thus their own gps solution), and another member is rolling out his own gsm stack"
Carlos Yero for Abertay University Ethical Hacking Society — HackRF One "to be available to all students working on the Ethical Hacking degree with aim to overcome fear of SDR complexities"
We'll be doing more free stuff updates shortly, so check back soon! Also, please keep the free stuff requests coming. For information about how to request free Great Scott Gadgets hardware, please visit the Free Stuff page. Around the first of the year our contract manufacturer contacted us about an urgent problem with HackRF One production. They'd had to stop production because units coming off the line were failing at a high rate. This was quite a surprise because HackRF One is a mature product that has been manufactured regularly for a few years. I continued to find surprises as I went through the process of troubleshooting the problem, and I thought it made a fascinating tale that would be worth sharing. The reported failure was an inability to write firmware to the flash memory on the board. Our attention quickly turned to the flash chip itself because it was the one thing that had changed since the previous production. The original flash chip in the design had been discontinued, so we had selected a replacement from the same manufacturer. Although we had been careful to test the new chip prior to production, it seemed that somehow the change had resulted in a high failure rate. Had we overlooked a failure mode because we had tested too small a quantity of the new flash chips? Had the sample parts we tested been different than the parts used in the production? We quickly ordered parts from multiple sources and had our contract manufacturer send us some of their parts and new boards for testing. We began testing parts as soon as they arrived at our lab, but even after days of testing samples from various sources we were unable to reproduce the failures reported by the contract manufacturer. At one point I thought I managed to reproduce the failure on one of the new boards, but it only happened about 3% of the time. This failure happened regardless of which flash chip was used, and it was easy to work around by retrying. If it happened on the production line it probably wouldn't even be noticed because it was indistinguishable from a simple user error such as a poor cable connection or a missed button press. Eventually I determined that this low probability failure mode was something that affected older boards as well. It is something we might be able to fix, but it is a low priority. It certainly wasn't the same failure mode that had stopped production. It seemed that the new flash chip caused no problems, but then what could be causing the failures at the factory? We had them ship us more sample boards, specifically requesting boards that had exhibited failures. They had intended to send us those in the first shipment but accidentally left them out of the package. Because the flash chip was so strongly suspected at the time, we'd all thought that we'd be able to reproduce the failure with one or more of the many chips in that package anyway. One thing that had made it difficult for them to know which boards to ship was that any board that passed testing once would never fail again. For this reason they had deemed it more important to send us fresh, untested boards than boards that had failed and later passed. When the second batch of boards from the contract manufacturer arrived, we immediately started testing them. We weren't able to reproduce the failure on the first board in the shipment. We weren't able to reproduce the failure on the second board either! Fortunately the next three boards exhibited the failure, and we were finally able to observe the problem in our lab. I isolated the failure to something that happened before the actual programming of the flash, so I was able to develop a test procedure that left the flash empty, avoiding the scenario in which a board that passed once would never fail again. Even after being able to reliably reproduce the failure, it took several days of troubleshooting to fully understand the problem. It was a frustrating process at the time, but the root cause turned out to be quite an interesting bug. Although the initial symptom was a failure to program flash, the means of programming flash on a new board is actually a multi-step process. First the HackRF One is booted in Device Firmware Upgrade (DFU) mode. This is done by holding down the DFU button while powering on or resetting the board. In DFU mode, the HackRF's microcontroller executes a DFU bootloader function stored in ROM. The host computer speaks to the bootloader over USB and loads HackRF firmware into RAM. Then the bootloader executes this firmware which appears as a new USB device to the host. Finally the host uses a function of the firmware running in RAM to load another version of the firmware over USB and onto the flash chip. I found that the failure happened at the step in which the DFU bootloader launches our firmware from RAM. The load of firmware over USB into RAM appeared to work, but then the DFU bootloader dropped off the bus and the USB host was unable to re-enumerate the device. I probed the board with a voltmeter and oscilloscope, but nearly everything looked as expected. 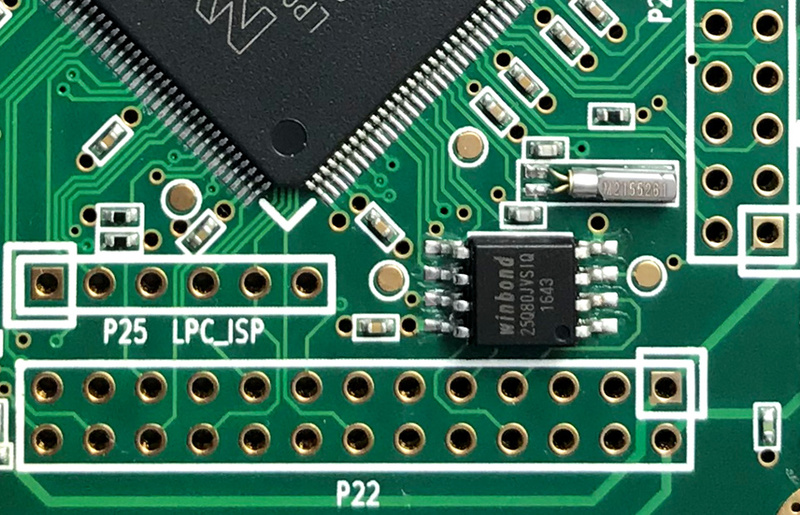 There was a fairly significant voltage glitch on the microcontroller's power supply (VCC), but a probe of a known good board from a previous production revealed a similar glitch. I made a note of it as something to investigate in the future, but it didn't seem to be anything new. I connected a Black Magic Probe and investigated the state of the microcontroller before and after the failure. Before the failure, the program counter pointed to the ROM region that contains the DFU bootloader. After the failure, the program counter still pointed to the ROM region, suggesting that control may never have passed to the HackRF firmware. I inspected RAM after the failure and found that our firmware was in the correct place but that the first 16 bytes had been replaced by 0xff. It made sense that the bootloader would not attempt to execute our code because it is supposed to perform an integrity check over the first few bytes. Since those bytes were corrupted, the bootloader should have refused to jump to our code. I monitored the USB communication to see if the firmware image was corrupted before being delivered to the bootloader, but the first 16 bytes were correct in transit. Nothing looked out of the ordinary on USB except that there was no indication that the HackRF firmware had started up. After the bootloader accepted the firmware image, it dropped off the bus, and then the bus was silent. As my testing progressed, I began to notice a curious thing, and our contract manufacturer reported the very same observation: The RF LED on the board sometimes was dimly illuminated in DFU mode and sometimes was completely off. Whenever it was off, the failure would occur; whenever it was dimly on, the board would pass testing. This inconsistency in the state of the RF LED is something that we had observed for years. I had never given it much thought but assumed it may have been caused by some known bugs in reset functions of the microcontroller. Suddenly this behavior was very interesting because it was strongly correlated with the new failure! What causes the RF LED to sometimes be dimly on at boot time? What causes the new failure? Could they be caused by the same thing? I took a look at the schematic which reminded me that the RF LED is not connected to a General-Purpose Input/Output (GPIO) pin of the microcontroller. Instead it directly indicates the state of the power supply (VAA) for the RF section of the board. When VAA is low (below about 1.5 Volts), the RF LED is off. 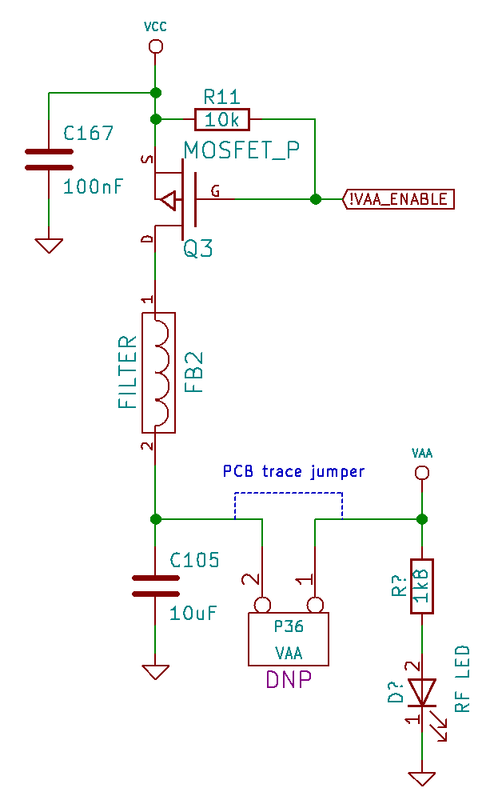 When VAA is at or near 3.3 Volts (the same voltage as VCC), the RF LED should be fully on. If the RF LED is dimly on, VAA must be at approximately 2 Volts, the forward voltage of the LED. This isn't enough voltage to power the chips in the RF section, but it is enough to dimly illuminate the LED. VAA is derived from VCC but is controlled by a MOSFET which switches VAA on and off. At boot time, the MOSFET should be switched off, but somehow some current can leak into VAA. I wasn't sure if this leakage was due to the state of the GPIO signal that controls the MOSFET (!VAA_ENABLE) or if it could be from one of several digital control signals that extend from the VCC power domain into the VAA power domain. I probed all of those signals on both a good board and a failing board but didn't find any significant differences. It wasn't clear why VAA was sometimes partially charged at start-up, and I couldn't find any indication of what might be different between a good board and a bad board. One thing that was clear was that the RF LED was always dimly illuminated immediately after a failure. If I reset a board into DFU mode using the reset button after a failure, the RF LED would remain dimly lit, and the failure would be avoided on the second attempt. If I reset a board into DFU mode by removing and restoring power instead of using the reset button, the RF LED state became unpredictable. The procedural workaround of retrying with the reset button would have been sufficient to proceed with manufacturing except that we were nervous about shipping boards that would give end users trouble if they need to recover from a load of faulty firmware. It might be a support nightmare to have units in the field that do not provide a reliable means of restoring firmware. We certainly wanted to at least understand the root cause of the problem before agreeing to ship units that would require users to follow a procedural workaround. Meanwhile I had removed a large number of components from one of the failing boards. I had started this process after determining that the flash chip was not causing the problem. In order to prove this without a doubt, I entirely removed the flash chip from a failing board and was still able to reproduce the failure. I had continued removing components that seemed unrelated to the failure just to prove to myself that they were not involved. 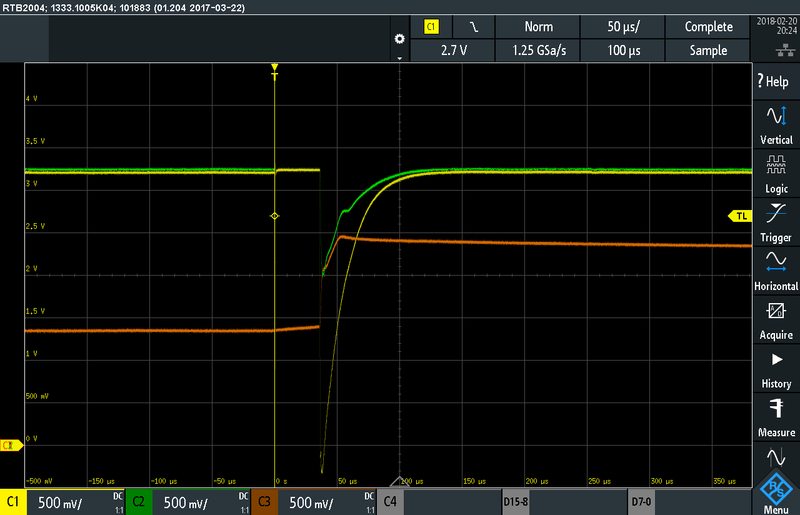 When investigating the correlation with VAA, I tried removing the MOSFET (Q3) and found that the failure did not occur when Q3 was absent! I also found that removal of the ferrite filter (FB2) on VAA or the capacitor (C105) would prevent the failure. Whenever any of these three components was removed, the failure could be avoided. I tried cutting the trace (P36) that connects the VAA MOSFET and filter to the rest of VAA. Even without any connection to the load, I could prevent the failure by removing any of those three components and induce the failure by restoring all three. Perhaps the charging of VAA was not only correlated with the failure but was somehow the cause of the failure! This prompted me to spend some time investigating VAA, VCC, and !VAA_ENABLE more thoroughly. I wanted to fully understand why VAA was sometimes partially charged and why the failure only happened when it was uncharged. I used an oscilloscope to probe all three signals simultaneously, and I tried triggering on changes to any of the three. Before long I found that triggering on !VAA_ENABLE was most fruitful. It turned out that !VAA_ENABLE was being pulled low very briefly at the approximate time of the failure. This signal was meant to remain high until the HackRF firmware pulls it low to switch on VAA. Why was the DFU bootloader toggling this pin before executing our firmware? Had something changed in the DFU bootloader ROM? I used the Black Magic Probe to dump the ROM from one of the new microcontrollers, but it was the same as the ROM on older ones. I even swapped the microcontrollers of a good board and a bad board; the bad board continued to fail even with a known good microcontroller, and the good board never exhibited a problem with the new microcontroller installed. I investigated the behavior of !VAA_ENABLE on a good board and found that a similar glitch happened prior to the point in time at which the HackRF firmware pulls it low. I didn't understand what was different between a good board and a bad board, but it seemed that this behavior of !VAA_ENABLE was somehow responsible for the failure. The transient change in !VAA_ENABLE caused a small rise in VAA and a brief, very small dip in VCC. It didn't look like this dip would be enough to cause a problem on the microcontroller, but, on the assumption that it might, I experimented with ways to avoid affecting VCC as much. I found that a reliable hardware workaround was to install a 1 kΩ resistor between VAA and VCC. This caused VAA to always be partially charged prior to !VAA_ENABLE being toggled, and it prevented the failure. It wasn't a very attractive workaround because there isn't a good place to install the resistor without changing the layout of the board, but we were able to confirm that it was effective on all boards that suffered from the failure. Trying to determine why the DFU bootloader might toggle !VAA_ENABLE, I looked at the documented functions available on the microcontroller's pin that is used for that signal. Its default function is GPIO, but it has a secondary function as a part of an external memory interface. Was it possible that the DFU bootloader was activating the external memory interface when writing the firmware to internal RAM? Had I made a terrible error when I selected that pin years ago, unaware of this bootloader behavior? Unfortunately the DFU bootloader is a ROM function provided by the microcontroller vendor, so we don't have source code for it. I did some cursory reverse engineering of the ROM but couldn't find any indication that it possesses the capability of activating the external memory interface. I tried using the Black Magic Probe to single step through instructions, but it wasn't fast enough to avoid USB timeouts while single stepping. I set a watchpoint on a register that should be set when powering up the external memory interface, but it never seemed to happen. Then I tried setting a watchpoint on the register that sets the pin function, and suddenly something very surprising was revealed to me. The first time the pin function was set was in my own code executing from RAM. The bootloader was actually executing my firmware even when the failure occurred! After a brief moment of disbelief I realized what was going on. The reason I had thought that my firmware never ran was that the program counter pointed to ROM both before and after the failure, but that wasn't because my code never executed. A ROM function was running after the failure because the microcontroller was being reset during the failure. The failure was occurring during execution of my own code and was likely something I could fix in software! Part of the reason I had misinterpreted this behavior was that I had been thinking about the bootloader as "the DFU bootloader", but it is actually a unified bootloader that supports several different boot methods. Even when booting to flash memory, the default boot option for HackRF One, the first code executed by the microcontroller is the bootloader in ROM which later passes control to the firmware in flash. You don't hold down the DFU button to cause the bootloader to execute, you hold down the button to instruct the bootloader to load code from USB DFU instead of flash. Suddenly I understood that the memory corruption was something that happened as an effect of the failure; it wasn't part of the cause. I also understood why the failure did not seem to occur after a board passed testing once. During the test, firmware is written to flash. If the failure occurs at any time thereafter, the microcontroller resets and boots from flash, behaving similarly to how it would behave if it had correctly executed code that had been loaded via USB into RAM. The reason the board was stuck in a ROM function after a failure on a board with empty flash was simply that the bootloader was unable to detect valid firmware in flash after reset. It seemed clear that the microcontroller must be experiencing a reset due to a voltage glitch on VCC, but the glitch that I had observed on failing boards seemed too small to have caused a reset. When I realized this, I took some more measurements of VCC and zoomed out to a wider view on the oscilloscope. There was a second glitch! The second glitch in VCC was much bigger than the first. It was also caused by !VAA_ENABLE being pulled low, but this time it was held low long enough to have a much larger effect on VCC. In fact, this was the same glitch that I had previously observed on known good boards. I then determined that the first glitch was caused by a minor bug in the way our firmware configured the GPIO pin. The second glitch was caused by the deliberate activation of !VAA_ENABLE. When a good board starts up, it pulls !VAA_ENABLE low to activate the MOSFET that switches on VAA. At this time, quite a bit of current gets dumped into the capacitor (C105) in a short amount of time. This is a perfect recipe for causing a brief drop in VCC. I knew about this potential problem when I designed the circuit, but I guess I didn't carefully measure it at the time. It never seemed to cause a problem on my prototypes. When a bad board starts up, the exact same thing happens except the voltage drop of VCC is just a little bit deeper. This causes a microcontroller reset, resulting in !VAA_ENABLE being pulled high again. During this brief glitch VAA becomes partially charged, which is why the RF LED is dimly lit after a failure. If VAA is partially charged before !VAA_ENABLE is pulled low, less current is required to fully charge it, so the voltage glitch on VCC isn't deep enough to cause a reset. 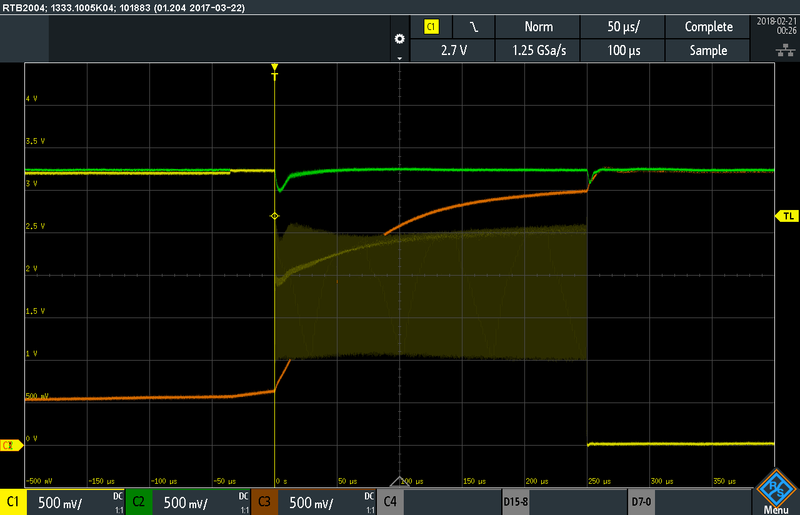 At this point I figured out that the reason the state of the RF LED is unpredictable after power is applied is that it depends on how long power has been removed from the board. If you unplug a board with VAA at least partially charged but then plug it back in within two seconds, VAA will still be partially charged. If you leave it disconnected from power for at least five seconds, VAA will be thoroughly discharged and the RF LED will be off after plugging it back in. This sort of voltage glitch is something hardware hackers introduce at times as a fault injection attack to cause microcontrollers to misbehave in useful ways. In this case, my microcontroller was glitching itself, which was not a good thing! Fortunately I was able to fix the problem by rapidly toggling !VAA_ENABLE many times, causing VAA to charge more slowly and avoiding the VCC glitch. I'm still not entirely sure why boards from the new production seem to be more sensitive to this failure than older boards, but I have a guess. My guess is that a certain percentage of units have always suffered from this problem but that they have gone undetected. The people programming the boards in previous productions may have figured out on their own that they could save time by using the reset button instead of unplugging a board and plugging it back in to try again. If they did so, they would have had a very high success rate on second attempts even when programming failed the first time. If a new employee or two were doing the programming this time, they may have followed their instructions more carefully, removing failing boards from power before re-testing them. Even if my guess is wrong, it seems that my design was always very close to having this problem. Known good boards suffered from less of a glitch, but they still experienced a glitch that was close to the threshold that would cause a reset. It is entirely possible that subtle changes in the characteristics of capacitors or other components on the board could cause this glitch to be greater or smaller from one batch to the next. Once a HackRF One has had its flash programmed, the problem is very likely to go undetected forever. It turns out that this glitch can happen even when a board is booted from flash, not just when starting it up in DFU mode. When starting from flash, however, a glitch-induced reset results in another boot from flash, this time with VAA charged up a little bit more. After one or two resets that happen in the blink of an eye, it starts up normally without a glitch. Unless you know what to look for, it is quite unlikely that you would ever detect the fault. Because of this and the fact that we didn't have a way to distinguish between firmware running from flash and RAM, the failure was difficult for us to reproduce and observe reliably before we understood it. Another thing that complicated troubleshooting was that I was very focused on looking for something that had changed since the previous production. It turned out that the voltage glitch was only subtly worse than it was on the older boards I tested, so I overlooked it as a possible cause. I don't know that it was necessarily wrong to have this focus, but I might have found the root cause faster had I concentrated more on understanding the problem and less on trying to find things that had changed. In the end I found that it was my own hardware design that caused the problem. It was another example of something Jared Boone often says. I call it ShareBrained's Razor: "If your project is broken, it is probably your fault.". It isn't your compiler or your components or your tools; it is something you did yourself. Thank you to everyone who helped with this troubleshooting process, especially the entire GSG team, Etonnet, and Kate Temkin. Also thank you to the pioneers of antibiotics without which I would have had a significantly more difficult recovery from the bronchitis that afflicted me during this effort! "We helped finish a project in Python that fetches information about wireless devices from the Federal Communications Commission's website. We were able to take the information and put it into the user's home directory as well as into a user-friendly database. Additionally, we learned how to use the Lasersaur laser cutter and cut packaging for the new HackRF acrylic cases. Finally, we learned how to test HackRFs to look for any firmware or LED issues on the boards." Going forward, we want to involve Ellie and Jacob in several of our software and firmware development projects (including GreatFET). They will be mentored by Mike and Dominic, and we hope that their time with us will amount to a meaningful educational and professional experience that they can take with them into their future careers. Are you (or do you know someone who is) a match for our open position for a summer intern? See our new jobs page for details. Keep an eye on this page for future job opportunities at Great Scott Gadgets! It's been a while since we've posted, but yes, we are still giving away free stuff! Even though we can't respond to each and every email, we do read and carefully consider all of them, and we choose at least one awesome group, project, or individual each month to send some free hardware to. Here are the free stuff recipients for the first half of 2016. We gave a HackRF One to developer and pilot Christopher Young, whose latest development project is an in-flight ADS-B Out transponder. ADS-B Out allows pilots to broadcast position, ground speed, and altitude to air traffic controllers and aircraft that are equipped with ADS-B In. This project benefits general aviation pilots because NextGen, the FAA's new plan to increase aviation safety, mandates that all aircraft be equipped with ADS-B Out by the year 2020. Christopher's open source design is intended give pilots a more affordable means of complying with the new requirement (ADS-B out is a piece of avionics equipment that normally costs thousands of dollars). Chris is also the creator of the stratux project, an affordable open source aviation weather and traffic receiver solution based on low-cost SDRs, so we are excited to put a HackRF into his capable hands. We gave a HackRF One to Alexis Duque, a Phd candidate at INSA in Lyon, France. He is researching the possibilities of visible light communication, and wants to use SDR hardware and GNURadio for some tests. He plans to donate his HackRF to CorteXlab at INSA after the research is complete. 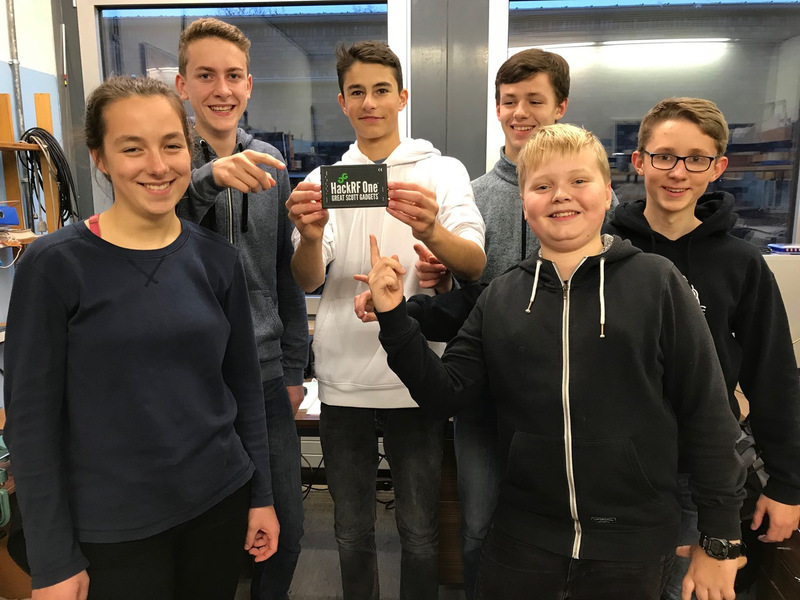 We received a free stuff request for a YARD Stick One from Pedro, a high school student at a technical school in southern Brazil who has started a hackerspace called Fablab with a group of his friends. Their school has given them space to work in, but due to equipment costs and crippling taxes imposed on electronics equipment there, they have been unable to find the funds to stock their lab and are relying on donations from the community. We sent them a YARD Stick One so that their group can experiment with communications with a drone they received from a local university. Speaking of South America, we gave a HackRF to Martin Gallo, coordinator of TandilSec, a meetup group in Tandil, Argentina who discuss infosec topics and learn about current trends. 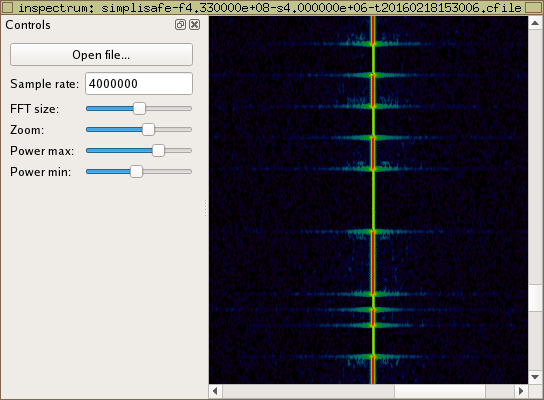 They have recently been experimenting with is SDR, and HackRF One was their hardware of choice. We gave a HackRF One to the Qspectrumanalyzer open source project because it currently only supports rtl-sdr, and the developer of that program wanted to change that. He tells us that a popular request from users is that they would like to see support for HackRF One. Pavel is a ham radio operator, self-described tinkerer, and software developer. He is involved with a local amateur radio club, but lives in an area where good radio equipment is difficult to obtain, and the equipment they are able to get their hands on is usually in need of repair. Pavel asked us for a HackRF One to diagnose and test problems, which will help him repair the radio equipment of other amateur radio operators in his community. Stay tuned; more free stuff updates are on the way! Visit our free stuff page to learn how to submit a request. Today we are excited to announce the official release of ANT700, our new 300—1100 MHz telescopic antenna. Because this general purpose antenna was designed with YARD Stick One users in mind, it has a slim and lightweight form factor that works well with smaller devices. It has an SMA male connector to attach to your device of choice (including HackRF One) and can be extended from 9.5 cm to 24.5 cm. We started distributing ANT700 last month, and it is already available for purchase from six of our authorized resellers on four continents. To find out where you can purchase yours, please visit the product page. Earlier this month, we packed our things and moved our lab and offices to a new location in Evergreen, Colorado. We are are very excited to be in a bigger space (it was time!) and to celebrate, we are hosting an open house on Friday, September 16th from 5 pm to 8 pm. We welcome our friends, associates, and neighbors to come and see our new lab and enjoy food and drink with us. Please let us know you are coming so we don't run out of provisions! RSVP by September 10th to info@greatscottgadgets.com. The Great Scott Gadgets team has been hard at work sorting through all the Free Stuff requests for 2015, and now we are finally ready to announce the winners for May through December. We've had many interesting submissions, and we've enjoyed learning about all the ideas you have had for open source projects and education. After much discussion and some tough decisions, we've chosen the following seven individuals and groups to receive free hardware from Great Scott Gadgets. Richard Doell wrote to us requesting a HackRF One for a project idea he is working on. We were intrigued by the project, and very excited to hear that it is going to be open source. Richard has a background in robotics and computer vision, and he wants to create a universal automatic drone API generator for hobbyists and robotics junkies that will allow remote control vehicles to be controlled from a computer using GNU Radio. His HackRF One will enable him to collect data from the RC vehicles' transmitters. Keep us updated about the progress of your project, Richard! Stefan Hessel (of the blog Causa Finita) is a security expert who works at the Department of Law and Informatics at Saarland University in Germany. After work, he gets involved in his community through an IT working group, offering free classes at a local clubhouse that help beginners develop skills and knowledge in the areas of Internet safety and security. Stefan asked us to donate a HackRF One to help him teach the basics of SDR to the people who attend his classes and to demonstrate ways that attackers could gain access to private data through hardware hacking. Thanks Stefan, for sharing your expertise and using your workshops to bring awareness to these issues. Let's Build Rockets is publishing all of their design files, code, and test data on github so that others can benefit from their learning and experience. We're excited to support this awesome, educational, open source project. Rocket on! We are happy to put a free HackRF into the hands of someone who can use it to make the world a better place. It's very satisfying knowing that somewhere in New York, a HackRF One is enabling communication that could save lives. Every November, high school students from around the country and even around the world come to MIT for a program called Splash. It is a weekend where they can engage in unique and valuable learning experiences that are unavailable in a normal classroom setting. Riley Drake wrote to us asking for a HackRF One for a Software Defined Radio course he is planning to teach at Splash 2016, which will cover topics such as Digital Signal Processing, Decibels, Data Types, Sample Rates, Negative Frequencies, Quantization Error and Complex Numbers in Digital Signal Processing (course structure mirrors Michael Ossmann's online lessons). Having a HackRF One available for the class will allow students to run their code on a real radio and promote a discussion of the legal and regulatory issues of SDR. Good luck with your class Riley, and please send us pictures! We'd love to know how it goes. Hacklab Almeria is a growing group of developers and enthusiasts in Spain that are learning and collaborating together. When they first wrote to us in October of 2015, they had 30 members, but when we contacted them last month that number had increased to 50. Jesus Marin Garcia asked for several Throwing Star LAN Tap Kits for a workshop the group are offering to their newer members on electronics fundamentals and soldering. Spread the word, and good luck with your workshop! András Retzler is the developer of a remote spectrum monitoring solution called OpenWebRX that gives users access to multiple SDR receivers worldwide. We gave András a free HackRF One, which he is using to improve support for that project. If you haven't already seen OpenWebRX, you should certainly check it out—it's really cool. He also plans to use his HackRF One to serve as a test station for another of his open source projects, qtcsdr, an open source amateur radio transceiver design using a Raspberry Pi 2 as a transmitter and an RTL-SDR as a receiver. As a company that is built on open source principles, we are very enthusiastic about supporting open source projects, and we are especially happy to help András with OpenWebRX. Thanks again to everyone who has sent us a free stuff request. We are almost all caught up now, and we will announce winners for the first few months of 2016 soon. If you have an idea for a project using Great Scott Gadgets hardware and could benefit from free stuff, don't hesitate to tell us about it. If you don't ask, we can't say yes! Fortunately in this video you can't hear the jackhammers at work in the hotel lobby while I gave this presentation at the ToorCon San Diego seminars in October, 2013. Apart from having to talk over the construction noise, it was great to share SDR techniques that can be used to point out flaws in security claims made about spread spectrum communication technologies. One of the things I showed in the talk was how Direct Sequence Spread Spectrum (DSSS) communications can be reverse engineered. I used SPOT Connect, a device operating on the GlobalStar satellite network as an example. A couple years later, Colby Moore did a more complete job of showing how the GlobalStar system can be attacked. If you aren't familiar with the Pastor Manul Laphroaig, mentioned at the beginning of this talk, check out our PoC||GTFO mirror. My, how time flies! The Great Scott Gadgets team has been busy, but we haven't forgotten all of your requests for FREE STUFF! We are working towards getting caught up, so please bear with us as we sort it all out. April had a lot of good submissions, and we are excited to reward several of you with free open source hardware. And to make up for being so behind, we even awarded a YARD Stick One this time, and we shipped it when it was brand new! Read on to learn about April's winning Free Stuff submissions. "It would be awesome to apply this legendary and revolutionary RF hacking tool of the decade into the hacking together of the next amateur built, amateur radio spacecraft!" Yup! Damon, make it so. Jesus Sanchez wrote to us on behalf of the Advanced Communications Research Laboratory he founded at his university last February. The Advanced Communications Research Laboratory encourages its members to conduct research in the wide field of SDR and to promote open source software and hardware. We are happy to support these goals by awarding the Advanced Communications Research Laboratory a free HackRF One! Tamer Çelik is a member of Hackerspace Istanbul. Tamer plans to use his HackRF One to introduce SDR to his hackerspace as well as other hackerspaces in his area. Tamer, thanks for spreading the word and sharing SDR technology with your community! David De La Hoz Joaquin is a student of Systems and Computer Engineering at Pontificia Universidad Católica Madre y Maestra in Santiago De Los Caballeros, Dominican Republic. David plans to use his HackRF One in his research. He will also be giving talks about SDR at his school and beyond. David is even planning to start a hackerspace at his school. Good luck David! José Perez Junior is a graduate student at ABC Federal University in Santo André, Brazil. He plans to use his HackRF One to teach students at the university about RF and SDR. He also plans to use it for his own research on SDR and electronic motor control. Congratulations José, and let us know how your research goes! Sean Semple wrote to us as president of the Association of Cyber Engineers (ACE) at Louisiana Tech University. ACE is an organization that was established a couple of years ago to promote the new Cyber Engineering degree program at Louisiana Tech, but also to help students learn about the cyber landscape as early in their career as possible. Great Scott Gadgets is happy to provide ACE with their very own YARD Stick One! Once again, thanks to everyone that sent us a request. If you didn't send us a request, why not? It never hurts to ask. We look forward to seeing what you come up with next! Earlier this week, Dr. Andrew Zonenberg of IOActive published a security advisory and blog post describing weaknesses in the SimpliSafe home security system. He showed that components of the system, such as the keypad, transmit unencrypted radio signals that can be captured and replayed. He also pointed out the significant problem that SimpliSafe devices are physically incapable of being reprogrammed with improved firmware that might address such vulnerabilities. I know Andrew and have great respect for his reverse engineering and hardware hacking talents. He implemented a replay attack by making small modifications to SimpliSafe devices, monitoring and controlling them from his own hardware platform. To demonstrate the impact of the technique, he showed how it could be used to replay a PIN that disarms a SimpliSafe system. While I found his attack very effective, I was intrigued by his inability to fully decode PINs. I wanted to take a crack at the problem myself, and I thought it would be worthwhile to confirm that the radio interface of the system can be attacked at a lower cost to the attacker, without any SimpliSafe hardware, and without physical proximity to the target system. I borrowed a SimpliSafe system to use as a target system, and I took the approach I have demonstrated in my presentation, Rapid Radio Reversing, using a combination of Software Defined Radio (SDR) and non-SDR tools. The primary tool I used was YARD Stick One with RfCat software. First I used HackRF One to monitor transmissions from the SimpliSafe keypad. I visualized a captured radio waveform with inspectrum and quickly identified an Amplitude Shift Keying (ASK) signal being transmitted by keypad. Andrew labeled this On-Off Keying (OOK), but the difference between ASK and OOK is subtle and does not affect his findings. After determining the frequency, modulation, and symbol rate of the transmission, I turned to YARD Stick One for further analysis. Within seconds I was able to decode raw symbols being transmitted by the keypad. It was easy to identify which packets were transmitted by the keypad after entering a PIN, so I entered a few different PINs and saved the resulting packets for analysis. It took me a couple hours of staring at packets and fiddling with short decoding functions in Python before I was able to understand the encoding. This was the most difficult part of the project. The system uses a somewhat uncommon Pulse Interval and Width Modulation (PIWM) to encode data onto the ASK signal, and the order of bits was not immediately obvious. With a little time, however, I was able to implement real-time decoding of received packets and to recover the PIN entered on the keypad by another person at a distance. I was also able to replay keypad transmissions. I could have implemented capture and replay even without fully decoding the packets. This is what Andrew was able to accomplish with his hardware hack. Full decoding, however, demonstrates that some additional attacks are possible. An attacker with a good antenna can monitor PINs from a great distance and can, without ever transmitting a radio signal, learn those PINs and later use them at the keypads. An attacker can craft packets with chosen PINs or other contents, so an automated brute force attack on a PIN is possible even if the attacker has not observed the valid PIN. The system uses 4-digit pins, so only 10,000 guesses are required for an exhaustive brute force attack. I could have accomplished all of this with only HackRF One or only YARD Stick One, but I used the combination of the two for convenience. If I had to choose just one for a project like this, it would be YARD Stick One which, at $100, costs less than half of the equipment used by Andrew. It could be done with almost any 433 MHz ASK transceiver, including the covert TURNIPSCHOOL or my favorite children's toy, the IM-Me, but YARD Stick One with RfCat is the most convenient tool for the job in my toolbox. Andrew included with his blog post a video demonstrating his attack over-the-air. In his video, he mentions that his hardware hack was the "quickest and easiest way" to accomplish his attack. That may be true for Andrew, but personally I found it easier to use radio tools. I wrote dozens of lines of Python compared to his hundreds of lines of C, and I never needed to crack open any SimpliSafe device. It took me about half a day, and most of that time was spent puzzling over the data encoding. I could have implemented a simple capture and replay within seconds of identifying the radio signal. Andrew's video shows him disarming an alarm from only a few inches away which unfortunately could be interpreted as meaning that his attack is only effective at such close range. His attack, in fact, works from anywhere the keypad can operate. According to the manual, it works within 100 feet of the base station. Even greater range can be achieved easily with the use of low cost radio test tools instead of a modified keypad. I estimate that, for less than the $250 Andrew spent, an attacker can execute PIN replay from about a mile away. Since Andrew's advisory, SimpliSafe has responded in predictable fashion while information security professionals filled their bingo cards. One of the things SimpliSafe has pointed out is that customers are notified whenever their systems are disarmed. Unfortunately this is only true for those customers who pay an extra $10 per month for SMS and email notifications. Moreover, in my testing, I verified that it is possible for an attacker to wirelessly command the SimpliSafe system to enter test mode even while the system is armed. This is something that normally can be done from the SimpliSafe keypad only while the system is disarmed. Alarms and notifications are disabled in test mode, but the documentation states that test mode is indicated in the online dashboard available to customers who pay for notifications. Following Andrew's lead, I am not publishing any attack software developed during my testing. However, it is important to realize that I employed only tools and techniques that are well known and commonly used throughout the wireless security community. Effective attacks, including PIN replay, can be implemented without writing a single line of code. Passive monitoring attacks, such as the ability to learn a PIN at a distance, require somewhat more reverse engineering effort but can be implemented with even less expensive equipment such as off-the-shelf TV tuners that cost as little as $10. Andrew's and my investigations only scratch the surface of the security of the SimpliSafe system. Andrew's key finding is not that PINs can be replayed but that the absence of basic cryptographic protections illustrates a total lack of wireless security engineering. Further weaknesses will very likely be discovered if anyone takes the time to look for them. For example, the cellular interface is an attack vector that remains unexplored as far as I know. 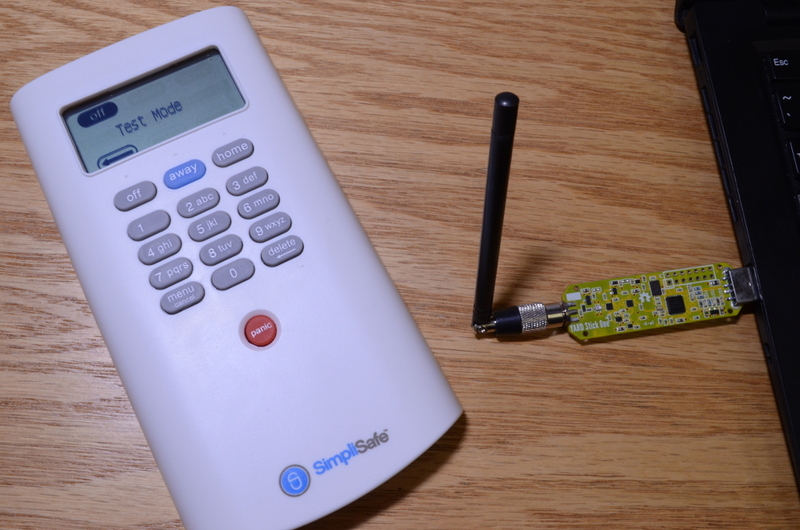 SimpliSafe is not alone in deploying alarm systems with vulnerable wireless interfaces. Sadly, almost every wireless alarm system I've ever looked at suffers from similar weaknesses. As we hurtle toward a future of ubiquitous digital wireless technology embedded in the objects of our daily lives, we would be wise to pay more attention to the security of those wireless interfaces. Burglar alarm systems seem like a good place to start. P.S. Dr. Zonenberg's dissertation is fascinating. In this video of my presentation at ToorCon 2015, I demonstrate how helpful it can be to use a combination of both SDR and non-SDR tools for reverse engineering wireless systems. I use both HackRF One and YARD Stick One to reverse engineer a wireless cabinet lock. We've fallen behind on shipping Free Stuff and even further behind on announcements, but we're catching up! Tariq Ahmad wrote to us representing the M5 hackerspace at UMASS Amherst. 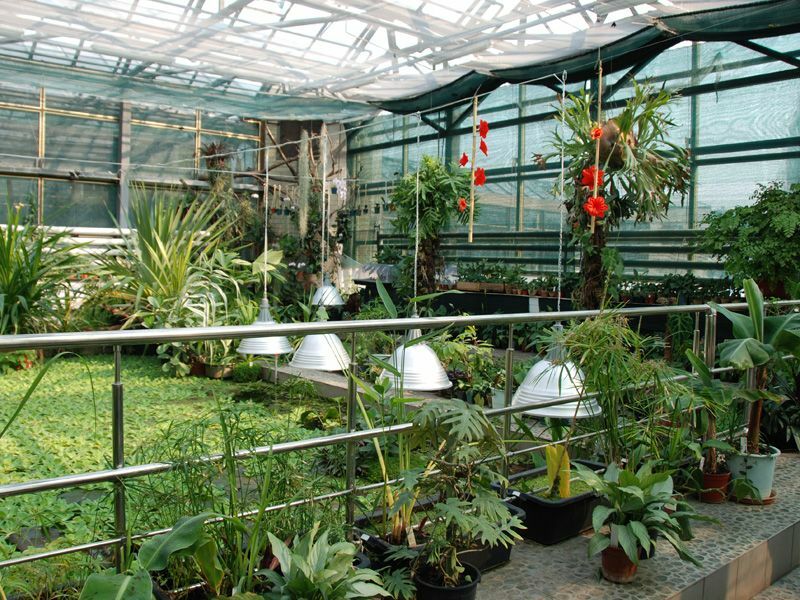 M5 has several ongoing projects including their Experimental College where students can take as well as teach classes just for the sake of learning. Tariq, we hope you and everyone at M5 can learn some new skills with your new HackRF One! This week we started shipping YARD Stick One, our latest test tool for radio systems operating below 1 GHz. The first thing you should know about it is that, unlike our popular HackRF One, YARD Stick One is not a Software Defined Radio (SDR) platform. Although we think that SDR is the overall best tool for the greatest number of wireless applications, sometimes it is beneficial to have a simpler tool for certain jobs. The architecture of YARD Stick One is similar to Ubertooth One; it is a wireless transceiver IC on a USB dongle. The IC takes care of digital modulation and demodulation, giving you an easy-to-use interface for your own software running on the attached host computer. YARD Stick One is the quickest and easiest way to start experimenting with low speed digital wireless technologies including industrial control systems, wireless sensor networks, smart meters, home automation systems, garage door openers, and remote keyless entry systems. RfCat made experimentation with low speed digital wireless systems easier than ever before, but it wasn't adopted as widely as I hoped it would be. Probably the biggest reason for that is the fact that, for a long time, the only way to get RfCat up and running was to buy a CC1111 development board, assemble a GoodFET yourself, and then use the GoodFET to write RfCat firmware onto the CC1111 board. It became apparent early on that we needed a device designed specifically for RfCat, one that ships with RfCat firmware and is ready to use. I designed the ToorCon 14 badge, which was a great success, but I wanted to make an even better platform available to the world. YARD Stick One was intended to be the ideal platform for RfCat. In addition to shipping with RfCat firmware, YARD Stick One is designed to operate effectively over the entire frequency range of the CC1111. All of the previous CC1111 boards that I know of are designed to work in only one frequency band. For example, you can get a CC1111 development board for 900 MHz or one for 433 MHz, but, prior to YARD Stick One, you couldn't find a CC1111 board that worked well in both those bands. It took a long while to complete YARD Stick One and get it manufactured, but we are finally shipping. Over the past couple years I've been able to get pre-release boards out to atlas and a few other folks who are active in wireless security research. For example, Samy Kamkar used YARD Stick One for the remote keyless entry system research that he presented at DEF CON in August. To get started with YARD Stick One, I recommend atlas's videos along with several blog posts written by early adopters of RfCat. You'll notice that, even though the users of RfCat tend to be well versed in SDR, they find RfCat useful to get hacking even faster on digital wireless communication systems. Today I submitted the following comment on the FCC's Notice of Proposed Rulemaking (NPRM) on Equipment Authorization and Electronic Labeling for Wireless Devices. Thank you for inviting comments on the proposed rules for Equipment Authorization and Electronic Labeling for Wireless Devices. I am the owner of Great Scott Gadgets, a US company that makes open source test equipment primarily for the information security industry. As a designer and manufacturer of communications equipment, I commend the Commission for seeking to clarify and streamline the rules for equipment authorization. I believe that, on the whole, the updated rules will benefit the electronics industry. However, I am concerned that the rules regarding software control of radio parameters place an undue burden on device manufacturers and unnecessarily restrict the actions of end users. My concerns arise from rules already in place for Software Defined Radio (SDR) devices. I am encouraged to see that the Commission is eliminating certain special rules for SDR equipment and seeks to treat SDR and non-SDR devices in the same way. However, while the Commission notes that "the existing SDR rules have proven to be insufficiently flexible," the proposed rules broaden the reach of those rules to non-SDR equipment. The requirement to implement security measures preventing the modification of software has long been unpopular in the SDR community. Software security is difficult, expensive, and unreliable, and it undermines reconfigurability, a principal benefit of SDR. The proposed rules extend this absurd requirement to all radio equipment with any software control, encompassing most radio devices manufactured today. Under the proposed rules, all radio device manufacturers would be required to devise software security mechanisms that do not exist today, and they would have to prepare for each new device software documentation that is currently not required. Makers of integrated circuits would have to develop entirely new product lines that provide device manufacturers with security mechanisms, killing off existing product lines that lack such controls. These requirements seem particularly onerous when considering the fact that computer security is largely an unsolved problem. Where manufacturers have had limited success preventing modification of software in electronic devices (e.g. in mobile phones), it has been accomplished only through great effort and expense. The engineering effort required to devise effective security measures (not to mention the cost and power consumption of cryptographic controls) may exceed the effort required to design many digital radio devices made today. A likely outcome is that software security mechanisms implemented in compliance with the proposed rules will prove ineffective and a waste of effort. Great Scott Gadgets designs and manufactures Open Source Hardware (OSHW). The OSHW community includes a small but rapidly growing segment of the electronics industry that is committed to the ideals that end users have a right to fully control their own equipment and that anyone should be able to study, make, use, modify, and sell devices based on our published designs. OSHW makers recognize that, just as Open Source Software has resulted in great advances in the software industry, Open Source Hardware will enable future generations of hardware innovation. As an OSHW designer, I have often been troubled by the Commission's rules for SDR. Great Scott Gadgets manufactures and sells HackRF One, an open source SDR platform popular for research and education. HackRF One is sold as test equipment, making it exempt from equipment authorization. As Open Source Hardware, however, it is a design that may be modified and sold by anyone. If someone were to use HackRF One as the basis for more specialized open source radio equipment that is not subject to the test equipment exemption, this new equipment would require authorization and would be subject to software security requirements that are incompatible with the open source license. We cannot grant open source licenses to users while locking out those same users. This fundamental incompatibility with open source licensing greatly concerns me. The software security requirements, now that they will apply to non-SDR devices under the proposed rules, will adversely impact not just designers and users of Open Source Hardware but anyone making or using Open Source Software with any radio equipment. Today innovation is stifled by rules that make it difficult or impossible to sell OSHW SDR devices that are anything other than test equipment. Under the proposed rules, even more innovation will be curtailed. I urge you to eliminate the software security requirements for both SDR and non-SDR equipment. Additionally I am concerned about the proposal to grant automatic long-term confidentiality to certain types of exhibits. The Commission's Equipment Authorization database is a great public resource that is better protected by the existing rule that grants long-term confidentiality only upon request. Jared Boone of ShareBrained Technology gave demonstrations of his new PortaPack H1 at the DEF CON 23 Demo Lab. I joined him at his table to help talk with people about the add-on for HackRF One. 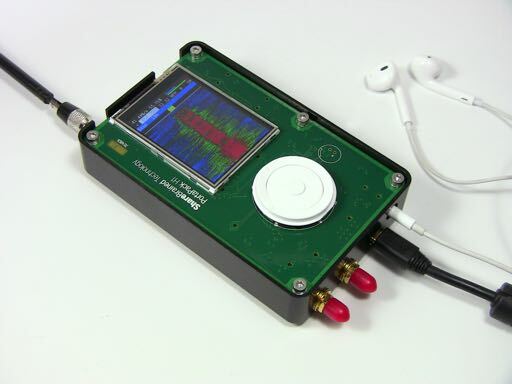 PortaPack H1 turns HackRF One into a portable SDR platform. With an LCD, navigation control, and audio input and output, the device can be used as a handheld spectrum analyzer and can implement a wide variety of useful radio functions. A microSD slot on the PortaPack can be used for waveform or firmware storage, and a coin cell keeps the real-time clock and a small amount of configuration RAM going while the device is turned off. Of course, the hardware designs and firmware for PortaPack H1 are published under an open source license. Jared has done an amazing job of implementing SDR functions for PortaPack that run entirely on HackRF One's ARM Cortex-M4 microcontroller. To use PortaPack H1, you'll need a HackRF One, and you'll probably want a USB battery pack to make it a fully portable solution. Another popular add-on is the beautiful milled Aluminum enclosure for PortaPack. Jared provides a ShareBrained Technology guitar pick with every PortaPack H1. It is the perfect tool for opening your HackRF One's injection molded plastic enclosure prior to PortaPack installation. There was a wonderful moment at the Demo Lab when Jared tuned his PortaPack to a frequency being used by Ang Cui at a nearby table. Jared's PortaPack was plugged in to a small speaker, so we could all listen to the AM radio transmission originating from a printer at Ang's table. The printer was physically unmodified but was running malicious software that transmitted radio signals with a funtenna! For more information about Ang's implementation, visit funtenna.org. Over the next several days, thousands of hackers will gather at the Chaos Communication Camp in Germany. An electronic badge for the event is being prepared, and it is based on my design for HackRF One! At DEF CON over the weekend, I was fortunate to be able to meet up with Ray, one of the members of the Munich CCC group responsible for the rad1o badge. Ray was wearing one of the prototype units, so I was able to take a close look. The design is a variation of HackRF One. It includes a small LCD and an audio interface, so it is a bit like having a HackRF One plus a PortaPack H1 on a single board. A slim, rechargeable LiPo battery is mounted on the back. The visual design of the PCB looks like a traditional AM/FM radio receiver complete with an antenna (which is not the actual RF antenna) and a dial (which is not really a dial). There are some design modifications, especially in the RF section, that seemed strange to me at first. The reason for many of these changes is that the rad1o team was able to get certain chip vendors to agree to sponsor the badge by donating parts. 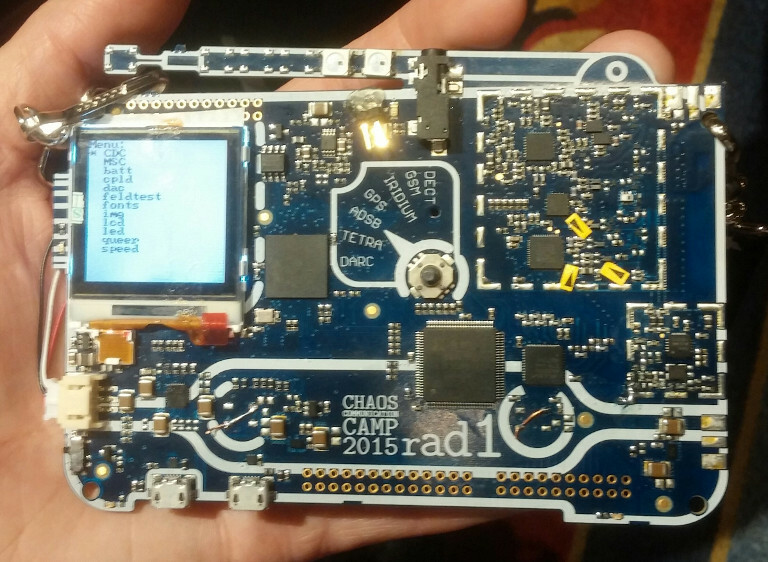 By redesigning around donated components they were able to reduce the cost to a small fraction of the cost of manufacturing HackRF One, making it possible to build the rad1o badge for several thousand campers. The firmware for rad1o is derived from HackRF One firmware but is in a separate repository. Because of the LCD and other differences between the two hardware designs, they are not firmware-compatible. When using rad1o as a USB peripheral, it is fully supported by existing software that supports HackRF One. Future rad1o firmware will use a USB product ID of 0xCC15 assigned from the Openmoko pool, but the shipping firmware will borrow HackRF One's product ID. This will ensure that any existing software for HackRF One will work with rad1o during camp. The new product ID (0xCC15) is already supported in libhackrf release 2015.07.2, so it should be easy for people to update to it in the near future. If you are new to Software Defined Radio and are looking forward to using the badge as a way to get started with SDR, I recommend starting with my video series. You might want to download the videos before leaving for camp. Also take a look at Getting Started with HackRF and GNU Radio and the recommended software for rad1o. If you plan to do firmware or hardware hacking, be sure to clone the rad1o repositories. For examples of Digital Signal Processing (DSP) on the LPC43xx, I suggest studying Jared Boone's firmware for PortaPack H1. 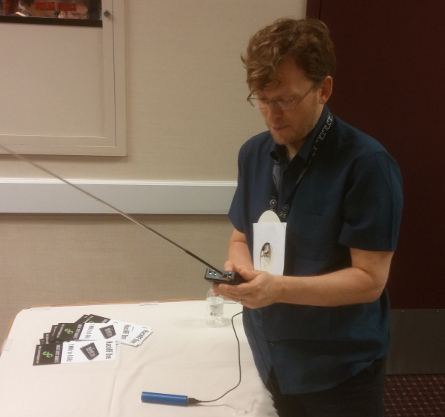 Also check out the video of Jared's Software-Defined Radio Signal Processing with a $5 Microcontroller at BSidesLV 2015. As an open source hardware developer, it is extremely satisfying to see folks start with my design and do something amazing like the rad1o badge. I'm excited to be attending camp for my first time ever, and I can't wait to see the projects people will come up with! Today I submitted the following comment on the Bureau of Industry and Security (BIS) Proposed Rule: Wassenaar Arrangement Plenary Agreements Implementation; Intrusion and Surveillance Items. Thank you for inviting comments on the Wassenaar Arrangement Plenary Agreements Implementation for Intrusion and Surveillance Items. As a member of the information security community, I am concerned about the effects of the proposed implementation on my industry. I'll keep this brief by voicing support for the comments made by other prominent members of the community: Google, Katie Moussouris, Robert Graham, and Sergey Bratus et al. My greatest concern is clarity of the proposed rule. If you must provide an answer to a frequently asked question about what a rule means, it may be because the rule was not written clearly. I was particularly troubled by the publication of the FAQ regarding the proposed rule, partly because it indicated a lack of clarity in the rule but also because the answers didn't seem much clearer. Had the answers been clear, I would still be concerned that the text of the rule would not be interpreted in the future in the same manner as your present interpretation. The text matters, and it is overbroad and unclear even to well informed members of the information security community. Unfortunately, computer security is an unsolved problem. The people who are working to improve the state of the art of computer security are diverse members of a global community of researchers. The proposed rule directly prevents the sharing of information among those researchers, and it will have a negative impact on the security of computing systems and software for the entire world. Software is a form of information, and control of the flow of information is very different from control of the transport of physical goods. I urge you to remove software from the scope of the Wassenaar Arrangement at the annual meeting of Wassenaar Arrangement members in December 2015. If you are a full-time university student and would like a free ticket to this summer's Black Hat Briefings, send an email to freestuff@greatscottgadgets.com today. We have two tickets to give away, and we would like to give them to students who share our interests. You must meet Black Hat's criteria, and you will be responsible for your own travel and lodging. We'll be busy at Black Hat USA this year. I'm teaching two sessions of my Software Defined Radio class, and I will be giving a talk at the Briefings about the NSA Playset. Additionally, Taylor and I will show off a new project called YARD Stick One at the Black Hat Arsenal. We've decided to advertise the fact that HackRF One operates all the way down to 1 MHz, not just to 10 MHz. This isn't a change to the hardware design; it is simply an acknowledgment that the hardware has always worked at such low frequencies and that we support operation down to 1 MHz. 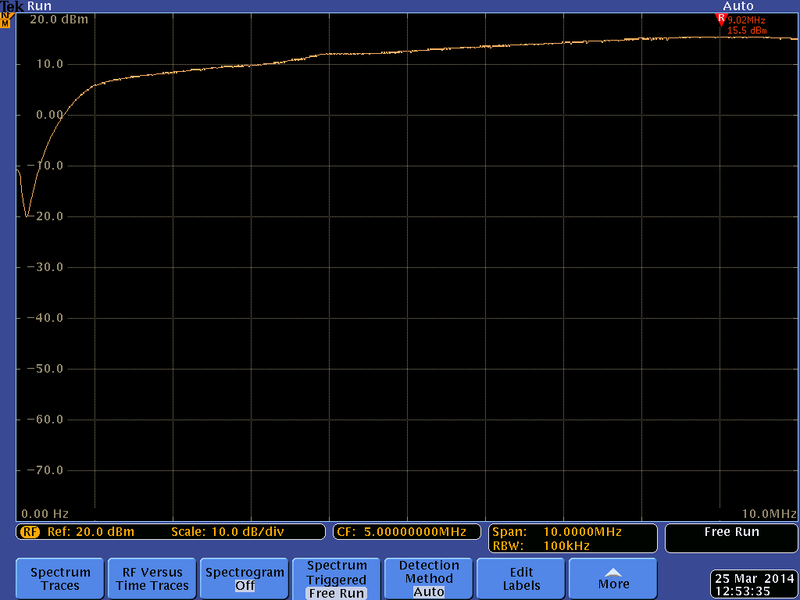 In fact, HackRF One can even function below 1 MHz, but the performance drops considerably as the frequency decreases. The curve is reasonably flat down to about 1 MHz, so we consider that to be the lower limit for most uses. Now that we've seen consistent low frequency performance across multiple manufacturing runs, we're comfortable changing the official specification: HackRF One operates from 1 MHz to 6 GHz. Try attaching a long wire antenna to listen to shortwave radio! Although HackRF One has reasonable performance down to 1 MHz, it performs better at higher frequencies. To get the best possible performance down to 1 MHz and lower, I recommend using an external upconverter/downconverter such as the excellent Ham It Up, open source hardware designed by Opendous. For the first time ever, Dominic, Taylor, and I will all be in the same place at the same time in June. We decided we should celebrate, and you are invited! Please join us at our recently expanded lab in Evergreen, Colorado on 11 June 2015 from 17:00 to 19:00. You can see the lab, talk to us about our projects, check out our latest prototypes, and even learn to solder! RSVP to info@greatscottgadgets.com by 4 June 2015 so we don't run out of refreshments. Great Scott Gadgets is pleased to announce the recipients of our inaugural Free Stuff give-away. This being our first give-away, we got a little overexcited and ended up giving away 5 HackRF One units to people who made requests in February! We were excited to see so much interest in our Free Stuff program, and after much deliberation we were able to narrow the field down to these 5 entrants. Congratulations, and we can't wait to see what you do with your HackRF Ones! Alex Page wrote to us representing the Interlock hackerspace in Rochester, New York, which has recently begun hosting SDR meetups. They have been encouraging those new to SDR as well as seasoned veterans, and they have made a space where they can all interact. We are awarding Interlock a HackRF One unit to encourage this sharing of knowledge. Thanks Alex, and keep up the good work. JinGen Lim is a promising student and developer from Singapore. When HackRF One was released he used it as an inspiration to build his own open source device called CCManager. We awarded JinGen a HackRF One unit to see what he can come up with next. Thanks for making your ideas open source JinGen! Rajesh Kannan is a licensed amateur radio operator and enthusiast as well as a rather successful amateur meteorologist. Rajesh has plans to use his HackRF One to help develop an HRPT satellite receiver with a group of students in India. Thanks Rajesh for igniting the RF spark in the next generation! Taavi Laadung is a graduate student at the Tallinn University of Technology in Estonia. He is working on a nanosatellite project and plans to use the HackRF One that we give him to help build a ground station. Thanks Taavi for including the HackRF One in your research. Chris Johns is a student at Spokane Community College in Spokane, Washington, and with the help of a few other members of their technology club Chris plans to use his HackRF One to start an amateur digital TV station. It's an interesting proposition, and we thank you for trying it out, Chris. Good luck! Thanks to everyone that sent us a request. If you didn’t send us a request, why not? It never hurts to ask. We look forward to seeing what you come up with next!